Do not miss this one- time opportunity to reconnect and celebrate with your brothers and their spouses. The warm, inviting surroundings of the new Iowa State Alumni Center will play host to all Lambda Chis on March 25​th​, 2017. It’s located in the ISU Center complex between C.Y. Stephens Auditorium and Jack Trice Stadium. 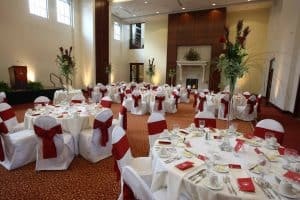 The Alumni Center at 420 Beach Avenue in Ames is the exciting setting for all 100th Anniversary evening activities to celebrate 100 Years of Alpha Tau Zeta. Arrive early to mingle in Cy’s Room for Reunion Reminiscing starting at 5:00 PM. Then, sit down to enjoy the two-course 100​th Anniversary Dinner starting at 6:00 PM in the Reiman Ballroom (South). 12 rooms booked at the new Hampton Inn on the east side of Ames off of Hwy 30. Dinner also includes Olive Oil Crushed Potatoes, Chefs Choice Vegetables, Market Salad, and Artisan Dinner Rolls. Who’s going to be there? See the current list of Men Attending 100th Anniversary Celebration. ATZ Corporation has announced a significant fundraising campaign to jump start extensive up grades and modernizing of the Chapter house. To Contribute to this effort, or to donate in honor of a brother, click here for the 100th Anniversary Campaign Contributions page. Buy 100 Years Dinner Tickets Online Now! 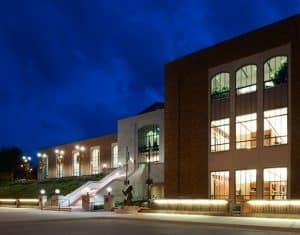 The 100th Anniversary Dinner will be served in the Reiman Ballroom (South) of The Alumni Center with room for 200 guests. Spouses are encouraged to attend!